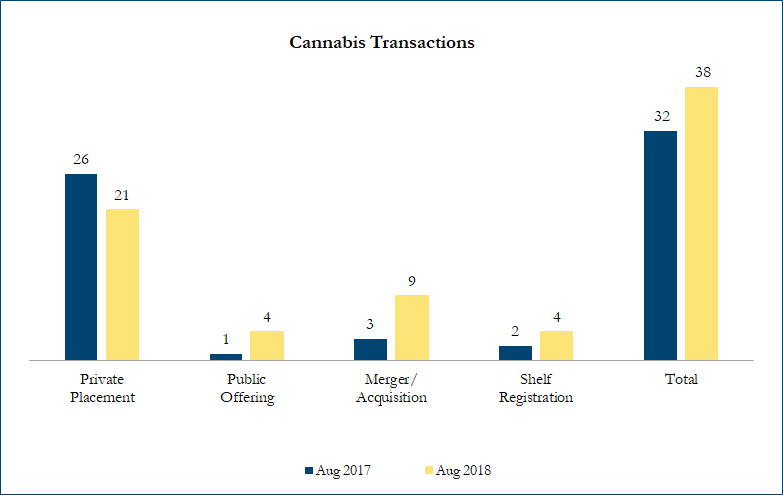 August 2018 Cannabis Transactions – Sinclair Range Inc. There were 38 transactions in the North American Cannabis sector in August 2018, including 21 private placements, 4 public offerings, 9 mergers & acquisitions and 4 shelf registrations, with a total value of C$5.5 billion. Total deal volume increased by 19% over August 2017 and transaction value increased by 2670%. The dominant transaction this month was Constellation Brands’ C$5 billion additional investment in Canopy Growth Corporation for 104.5 million shares, increasing its ownership to 38% as announced on August 15, 2018. Constellation Brands is acquiring the new shares at a price of C$48.60 per share, which is a 37.9% premium to Canopy’s 5-day volume weighted average price for more click here of the common shares on the Toronto Stock Exchange and a 51.2% premium to the closing price on August 14, 2018 (the last undisturbed price). The deal lead to a 32% increase in share price, with Canopy now trading at 103.8x Enterprise Value/Calendar 2019E Consensus EBITDA (Earnings before interest, taxes, depreciation and amortization). Calculations include asset purchases and sales, joint ventures and minority and majority shareholdings that disclosed a transaction value and were announced within the time frame. Cannabis industry definition includes cannabis products producers as well as supporting industries such as suppliers, laboratories, and security, among others. Cancelled transactions were excluded from the-german-server. Exchange rates based on historical figures. Sources: Capital IQ, analyst research. Want to receive a monthly update from Sinclair Range straight to your email box? Subscribe here!